While most fans turn up to Melrose Sevens to have fun, police say a minority spoil it by drinking too much. Borders police are urging those who are planning to go to Melrose Sevens not to allow alcohol to ruin their weekend. The tournament will take place between Saturday and Sunday, April 9-10, and it is anticipated tens of thousands of rugby fans will visit the town over the two days, many of whom will visit Melrose’s licensed premises during their stay. Local officers have been liaising with bar staff and door stewards ahead of the Sevens to remind employees of their licensing responsibilities and ensure that any offences that take place on licensed premises are reported to police immediately. Those visiting the area for the tournament, along with members of the local community, are reminded to drink responsibility and keep themselves safe while out and about within Melrose. 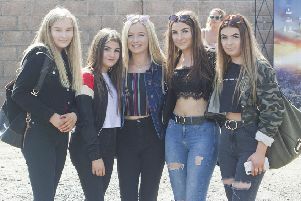 Police will also be focusing on tackling underage drinking and anyone under the age of 18 who is found either within the rugby ground, on the street or within a licensed premises consuming alcohol will have their drink taken from them and may face further police action. Inspector Mike Bennett from Galashiels Police station said: “This is always a really exciting time for Melrose, with several fantastic sevens teams taking part in the world-renowned tournament and thousands of spectators coming from all over to visit the area. “We know from previous experience that our licensed premises in Melrose are well-frequented during this weekend and while the overwhelming majority of the public know their limits and behave appropriately, a small minority find themselves involved in incidents of violence and disorder that often stem from drinking too much. “Local officers will be out on high-visibility patrols throughout the tournament to engage with the community and deter any criminal activity and we have already done a lot of work with the licensed premises within Melrose as part of our commitment to reduce alcohol-related offences.